Canadian Forces Base Esquimalt (CFB Esquimalt) is Canada's Pacific Coast naval base and home port to Maritime Forces Pacific and Joint Task Force Pacific Headquarters. As of 2018[update], 4,411 military personnel and 2,762 civilians work at CFB Esquimalt. 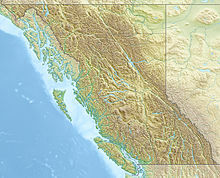 The base is located on Vancouver Island. 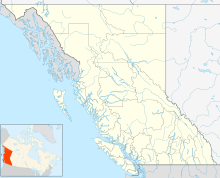 The base occupies approximately 41 km2 (10,000 acres) at the southern tip of Vancouver Island on the Strait of Juan de Fuca, in the municipality of Esquimalt, adjacent to the western limit of the provincial capital, Victoria. CFB Esquimalt comprises facilities that include Naden (formerly HMCS Naden), Her Majesty's Canadian (HMC) Dockyard Esquimalt, Fleet Maintenance Facility – Cape Breton (FMF CB), a Fire Fighting and Damage Control School, the Naval Officer Training Centre (NOTC) Venture, and extensive housing including 716 personnel married quarters located at nine sites such as Belmont Park, WorkPoint, and Royal Roads. The present dockyard and dry dock, known as HMC Dockyard Esquimalt, dates to the Royal Navy's Esquimalt Royal Navy Dockyard (1842–1905) and was the Royal Navy's Pacific Station until 1911. Today it serves as the Canadian Naval Headquarters in the Pacific. Due to their significance in Canadian naval history, four sites at CFB Esquimalt (the Dockyard, the former Royal Navy Hospital, the Veterans' Cemetery, and the Cole Island Magazine) have been designated the Esquimalt Naval Sites National Historic Site of Canada. HMCS Aurora, HMCS Patriot, and HMCS Patrician at Esquimalt in 1921. Orca of the Orca-class patrol vessels cruises among the Gulf Islands, 1 August 2007. HMCS Brandon, minesweeper based out of CFB Esquimalt. CFB Esquimalt on Vancouver Island, in the background the Olympic Peninsula. Map showing the three areas of the base. CFB Esquimalt contains several recognized and classified federal heritage buildings on the Register of the Government of Canada Heritage Buildings. The Institute for Stained Glass in Canada has documented the stained glass at the Multi-Faith Naval Chapel and the stained glass at the Old Naval and Garrison Church (1866), now known as St Paul's Anglican. CFB Esquimalt Naval & Military Museum is located at HMCS Naden. Building 20 (c. 1891), part of Naden Museum Square is a Municipal Heritage Property. Building 37 (c. 1889) part of the Naden Museum Square is also a Municipal Heritage Property and is also on the Canadian Register of Historic Places. HMCS Naden was named after the Dominion Government Ship Naden, which was commissioned as a tender for the Royal Naval College of Canada from 1918 to 1922 for training in sail. The museum is affiliated with: Canadian Museums Association (CMA), Canadian Heritage Information Network (CHIN), Organization of Military Museums of Canada (OMMC) and Virtual Museum of Canada. CFB Esquimalt operates a bus service to provide intra-base transportation. The Lookout is the base newspaper, which covers local, national and international news with specific interest to Navy and Canadian Forces members and family issues. Other properties that are part of CFB Esquimalt include the Albert Head training area near Albert Head, Metchosin, located approximately 30 km (19 mi) by road southwest of downtown Victoria. It occupies approximately 88 hectares (220 acres), four of which are developed as training facilities. Fort Albert Head was established in the late 1800s along with Fort Rodd Hill and other installations, to provide shore defence for the Strait of Juan de Fuca and Victoria Harbour. The training area is used for Regular and Reserve Force training throughout nine months of the year and is home to the Regional Cadet Instructor School (Pacific) that trains Canadian Forces Cadet Instructors Cadre (CIC) Branch that deliver the cadet program. During the summer months of June, July and August the area houses the Albert Head Air Cadet Summer Training Centre. Canadian Forces Maritime Experimental Test Range at Nanoose Bay is also part of CFB Esquimalt. The facility provides non-explosive technical testing of sonobuoys, torpedoes and other equipment. Naval Radio Section Aldergrove in the Fraser Valley houses transmitting and receiving equipment for long distance communications. Also, the CFB Esquimalt Base Fire Hall & Emergency Response Centre was founded to provides services to CFB Esquimalt and the civil community in the way of fire intervention and emergency response. CFB Esquimalt contributes nearly $600 million into the local community annually. CFB Esquimalt is the largest community employer. CFB Esquimalt provides 7,866 jobs in the community. CFB Esquimalt spends locally 770,847,000 dollars annually. ^ Naden lost its "HMCS" designation in unification when all Royal Canadian Navy (RCN) shore establishments became part of the Canadian Forces Base system. "Canada – National Defence: CFB Esquimalt – History Archived 13 June 2011 at the Wayback Machine"
^ Esquimalt Naval Sites National Historic Site of Canada. Directory of Federal Heritage Designations. Parks Canada. ^ "Canadian Navy: MARPAC – Maritime Forces Pacific – Esquimalt Harbour". 13 December 2006. Archived from the original on 13 June 2010. Retrieved 22 February 2010. 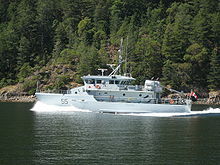 ^ "Search Results: CFB Esquimalt". Directory of Federal Heritage Designations. Parks Canada. Retrieved 23 March 2019. ^ Guard House Building 38. Canadian Register of Historic Places. ^ Belmont Road Main Gatehouse. Canadian Register of Historic Places. ^ Cow Barn and Dairy RR6. Canadian Register of Historic Places. ^ Gatehouse Lodge. Canadian Register of Historic Places. ^ Grant Block, Building 24. Canadian Register of Historic Places. ^ Gymnasium RR22. Canadian Register of Historic Places. ^ Hatley Castle. Canadian Register of Historic Places. ^ Nixon Block RR24A. Canadian Register of Historic Places. ^ Stable / Garage RR4. Canadian Register of Historic Places. ^ Swimming Pool RR22A. Canadian Register of Historic Places. ^ Building D101. Canadian Register of Historic Places. ^ CFB Esquimalt, Dockyard, Aldergrove Building, DY 199. Canadian Register of Historic Places. ^ CFB Esquimalt, Bickford Tower, Building D118. Canadian Register of Historic Places. ^ Building D211. Canadian Register of Historic Places. ^ Building D80, former Cordage / Furniture Stores. Canadian Register of Historic Places. ^ Building D175. Canadian Register of Historic Places. ^ Building D1. Canadian Register of Historic Places. ^ Building D51. Canadian Register of Historic Places. ^ Building D214. Canadian Register of Historic Places. ^ Building D70. Canadian Register of Historic Places. ^ Building D83. Canadian Register of Historic Places. ^ Building D77. Canadian Register of Historic Places. ^ Pump House. Canadian Register of Historic Places. ^ Building D26. Canadian Register of Historic Places. ^ Building D75-D76. Canadian Register of Historic Places. ^ Building D109. Canadian Register of Historic Places. ^ Shipwrights' Shed / Spar Shed, Building D113. Canadian Register of Historic Places. ^ Building D38. Canadian Register of Historic Places. ^ Transformer House. Canadian Register of Historic Places. ^ Veterans' Cemetery Chapel. Canadian Register of Historic Places. ^ Warehouse Building D85. Canadian Register of Historic Places. ^ a b Naden Museum Square, Building 37. Canadian Register of Historic Places. ^ Former Offices of the Officer-in-Charge. Canadian Register of Historic Places. ^ Naden, Museum Square, Building No. 35. Canadian Register of Historic Places. ^ Communications School, Building 67. Canadian Register of Historic Places. ^ Naden, Building Nos. 33, 33A, 33B. Canadian Register of Historic Places. ^ Gunnery School, former Building 50. Canadian Register of Historic Places. ^ Building 34. Canadian Register of Historic Places. ^ Naden Museum Square, Building 20. Canadian Register of Historic Places. ^ Protestant Chapel Building 39. Canadian Register of Historic Places. ^ Radar Training Building. Canadian Register of Historic Places. ^ Stores / Museum Warehouse, Building 29. Canadian Register of Historic Places. ^ Torpedo School, former Building 2. Canadian Register of Historic Places. ^ Trades Training Building. Canadian Register of Historic Places. ^ Former Armament Artificer's and Sergeant's Quarters, Building 522. Canadian Register of Historic Places. ^ Gun Emplacement, Building 578. Canadian Register of Historic Places. ^ Former Married Privates' Quarters, Building 523. Canadian Register of Historic Places. ^ Signal Hill No. 508. Canadian Register of Historic Places. ^ Work Point Barracks No. 1020. Canadian Register of Historic Places. ^ Royal Garrison Artillery Barracks’ Blocks, Building 1075. Canadian Register of Historic Places. ^ Work Point Barracks No. 1004. Canadian Register of Historic Places. ^ Work Point Guard House. Canadian Register of Historic Places. ^ "Multi-Faith Naval Chapel". Institute for Stained Glass In Canada. ^ "Old Naval and Garrison Church (1866)". Institute for Stained Glass In Canada. ^ "CFB Esquimalt Naval & Military Museum Home Page". Retrieved 2010-02-21. ^ "The Look-Out". Retrieved 2010-02-21. ^ "Maritime Forces Pacific". Royal Canadian Navy. Wikimedia Commons has media related to CFB Esquimalt. Esquimalt Naval Sites National Historic Site of Canada. Directory of Federal Heritage Designations. Parks Canada. This page was last edited on 23 March 2019, at 22:13 (UTC).